In the tradition of continuing a favorite feature here at SKOHRboard we are bringing back the SKOHRboard & Friends annual Mock Draft. This is the 2nd installment on the 2013 edition which will include the entire 1st Round of the draft. The 1st installment containing the 2nd Round can be found here. We turn to Justin to kick things off this year with the 1st pick in the 2013 SKOHRboard & Friends NFL Mock Draft! The Chiefs have already said that they are basically choosing between Luke Joeckel, Eric Fisher, and Dion Jordan with the first overall pick. We can throw Dion Jordan out because the Chiefs already have the personnel well-suited for a 3-4 defense, while they let one of their starters at tackle leave via free agency. Joeckel had a terrific career at A&M, He made the Big-12 teams in 2010 and 2011 and earned 1st Team All-America and 1st Team All-SEC in 2012, shutting down some of the top pass-rushers in the nation. Pass-blocking is paramount in an Andy Reid offense, and that is Joeckel's strength. This doesn't really see like much of a decision between the two, so I'm locking in the Chiefs for their franchise left tackle. The Jags need someone to get to the quarterback, so we strongly considered Jarvis Jones in this position. However, Werner adds a nice touch of German flair that will really galvanize the fan base. Also, he is the top DE prospect in the draft, and his time at FSU has given him plenty of local fans here in Jacksonville. He has a very high ceiling- we are talking about an exchange student that had never played football until he was 15 developing into top talent. His weight has varied from 275 during his breakout sophomore year to 250 in his final year at FSU, so it might take some time for him to find the best body type to last through an NFL season without losing more time to injury. All in all, we are excited for the countless Blitzkrieg puns which will be unfortunately and incorrectly uttered (as a DE can not be the contributor of a blitz). Despite forsaking his local powerhouse Rutgers University for the likes of a much swampier locale, Floyd has proven that he has what it takes to play and dominate against the best. Floyd is a monster coming off the edge and a perfect hybrid DT/DE prospect. He has the speed and quickness to play on the edge and the power/bulk to play heads up as a DT. Floyd will bolster the Raiders DLine immediately. Milliner is easily the best DB prospect in this years draft and the Eagles need all the help they can get back there with the departures of their previously under-performing squad. Milliner has been talked about as the potential #1 overall and while I don't think that will happen, I think that he makes sense here for the Eagles given the large amount of talent already in place. I'd also like to note that it would probably be in their best interest to trade down if at all possible. The Lions need defensive end help (among other things) with Kyle Vanden Bosch getting cut and Cliff Avril going to Seattle via free agency and Ansah is this year's version of Chandler Jones or Jason Pierre-Paul; players with little college production but great athletes who have huge upside for the NFL. A great senior bowl week helped Ansah's stock tremendously. Ansah is extremely fast, strong and explosive. He has the ability to beat offensive linemen with his power and speed. He possesses the potential to be a big-time impact player. If the Lions can't get any pressure on the quarterback, Aaron Rodgers is going to continue to shred their secondary, no matter who is starting back there. Cleveland Browns select Dion Jordan, DE/OLB from Oregon. The Browns strongly considered Geno Smith, but they decide to not take QB's in the 1st round in back to back years, instead giving Ray Horton a freak to help on defense. Putting him on one side and Paul Kruger on the other side, the Browns have suddenly evolved into a team that can get to the QB. He can even cover in space as well due to his speed. Cleveland is very excited that Jordan dropped to them. Buffalo thought long and hard about Geno Smith at this spot but ultimately decided there are too many hole in his game the warrant a top 10 pick. They decided to fill a big need and go with the best o-lineman available in Johnson who has all-pro potential. NY Jets select Star Loutlelei, NT, Utah This pick depends a lot on whether or not the Jets are able to get Tampa's 1st round pick, #13 in this draft. The Jets and Rex Ryan get their man who they hope is a future Star. Loutlelei dominated the Pac-12, and is a perfect fit in a 3-4 scheme that the Jets run, especially after losing their previous NT. Star is both fast and strong for his size, and can play in all situations. Players like Chance Warmack are to blame for the argument, could Alabama beat an NFL team. Warmack was a man amongst boys in nearly every game he played over the last couple of seasons. He's built like a house, wears his jersey too small to reveal his gut and is able to engage linebackers in the running game before they even know what to do with themselves. Pound for pound, he may be the best prospect in this draft class. Warmack is every bit worth a top 10 pick. After watching most of his games last year, it's clear that he has the potential to be a difference-maker on the interior of the offensive line. In a day and age when teams are bringing more and more pressure up the middle, Warmack's awareness and athleticism will be coveted on draft day. Roll Tide. Spine issues? Speed concerns? Who cares, this guy had dominated the SEC for a combined 28 sacks over the last 2 seasons. Despite being double teamed nearly every play, this guy led the nation in sacks, tackles for a loss and forced fumbles. As one scout put it; "Jarvis Jones is a heat seaking missle that tracks down ball carriers regardless of where they are on the field". Jones should be able to play and possibly start week 1 THIS year. He is a top 3 talent and the Titans are excited to see his line dancing skills in downtown Nashville for years to come. Cooper is downright explosive. What's even more impressive is that he's an explosive 300lb man. Cooper than easily slid into pass protection, work off of stunts, pick up blitzers and get to the 2nd level. He's the kind of guy who will help fill in the massive hole left by Jake Long and help protect Ryan Tannehill for years to come. Very good all around CB who will unfortunately not be taken here because this pick was traded to the Jets for a holdout machine named Darelle Revis. Cam Newton needs a weapon to grow old with, as Steve Smith is heading toward the end of his career and the Panthers have no weapons to groom under him. Austin steps in right away as the heir apparent and Smith takes him under his wing. Austin is a playmaker, and with the NFL gravitating more toward spread offenses, the speedy Austin combined with Cam helps give them a new dynamic for the future. If Austin is not there, they more than likely take the top corner available. The Saints have to go with a defensive stud here right? WRONG!!!! Sean Payton is back and he wants nothing more than to drop 45 points a game this year. The Saints defense can stop about as much as the city's levee system does and Sean Payton could care less. As long as Drew Brees can put up 40 points a game, Payton believes he can win. In Patterson they get a 6'2 speedster that can stretch the field every play. C'mon, do you think opposing defenses are really afraid of Colston, Henderson and Moore? Outside of Jimmy Graham and Darren Sproles, Brees has few reliable options. Patterson can also return kicks, which should save Sproles a few hits a week. Before really digging into this I thought Tavon Austin would be an amazing choice for the Rams. They could take advantage of Bradford's ability to make the quick short throws and get a guy who can turn a 5 yard catch into a 60 yard TD. Unfortunately he is already off the board here. Vaccaro however, is the class of this year's Safety group and will immediately step into a starting role for the Rams. After checking their website it would appear that the Rams currently have 2 total safeties on their roster, that's one free safety and one strong safety. While nobody uses a 1st round pick for depth, it's clear the Rams need some serious help on the backend and Vaccaro will provide a huge upgrade in talent to that position group. Expletive tirade about Vacarro being taken here has been removed due to SKOHRboard's family friendly nature. Richardson is settled for by the Steelers front office. The Cowboys offensive line is a huge weakness, but the Cowboys don't feel confident enough in DJ Fluker to make a commitment to replace Doug Free with a first round pick. Kenny Vaccaro and Sheldon Richardson were coveted, but each has already fallen off the board. With the Cowboys defense making the switch from 3-4 to 4-3 under, Dallas needs to find a pass-rushing end with speed around the edge. The 4-3 under is perfect for Mingo, and the Dallas defense sorely needs his talents to improve upon their woeful sack totals last year. Mingo is arguably the best athlete in this class, and he could always be asked to play with his hand in the grass one series and then drop into pass coverage the next. He'll probably have to put on a bit more weight, but his presence will give offenses fits when they try to figure out how to stop him and Demarcus Ware. He is a threat to lead the league in sacks if he gets the opportunity to play right away. The Giants have a number of different directions they can go here but they always follow the best available philosophy in the draft and this year will be no different. Ogletree is a sideline to sideline Lb that can come in and make an immediate impact. In the scenario the giants not only grab the best player available but also fill a huge need. The Bears already signed Bushrod to play left tackle and signed Matt Slausen to play guard. They draft Fluker to play immediately as well at the other guard. All of the sudden, the Bears have a formidable offensive line to protect Cutler. Fluker is a giant which is why he gets two pictures because look at that guy. Jay Cutler will have to find a new excuse as to why he only has 1 playoff win after this one. Cincinnati has a few needs that they are probably looking at here. I imagine they liked Tavon Austin quite a bit to pair with Green and Sanu. Vaccaro was probably high on their list as well. Alec Ogletree was appealing until we realized that he'd already been taken. The Bengals have selected Manelik Watson. Watson is somewhat new to the game but he is a physical freak and a very hard worker. With another year of football focused weight lifting especially at the NFL level he should be a stalwart on the offensive line for the Bengals. The Rams need some weapons, a weapon, something. Bradford has proven to be an effective quarterback when he can hit guys on quick timing routes. In order to make those successful he'll need WRs who can get some separation but most importantly, catch the ball in traffic. 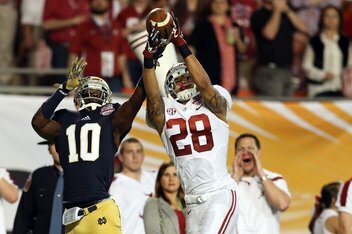 If there is one thing that Keenan Allen may hold above all other WRs in this draft is his ability to catch the ball. He is widely regarded with having some of the best hands in the draft and that includes making the difficult catches. While he isn't a burner, his hands and route running ability more than make up for it and he'll prove to be a 1st down machine for the Rams. The Vikings traded away one of the most electric players in the league this offseason, but they also let their starting middle linebacker walk. While receiver must be addressed, the Mike is even more of a priority based on true difference-makers at the position. In the Tampa 2 Over defense that the Vikings use, a three-down backer that can cover a deep and wide field is essential. He needs to be able to read each play for run-pass and then react to the slot: if that receiver runs a vertical, the mike has to be able to drop deep in the zone; if there is an under pattern, he'll have to close fast to limit yards after catch. While other linebackers might be considered "elite" options, they aren't a fit for the Vikings style of play. Brown, however, has tremendous speed for his weight, great hip movement and backpedal, and one of the best combos of agility and speed in this draft class. His tackling might be the best in the linebacker class, and his sideline-to-sideline range is fantastic. He might be considered short for his position, but he is as heavy as some of the other backers in the draft. He will be a Day 1 starter and a fixture at the position. The Colts select Xavier Rhodes, CB, FSU. The Colts still need another cornerback to pair with Vontae Davis and Darius Butler. Rhodes is a big corner, in the mold of the Seahawks cornerbacks, and has speed to back up his size by running a 4.43 40 at the combine. He was a 3 year starter for FSU and will match up well with bigger NFL WRs. The Vikings signed Greg Jennings after trading Percy Harvin away, but they still have one of the worst receiving corps in the league. At 6'4 and 196 pounds, Hunter has excellent size at the position. He is a savvy route runner and excels at reading coverage, plus he has good straight-line speed (4.44 40), especially for a guy his size. Hunter suffered a 2011 ACL tear, but he is back up to full speed now. He can use his size to beat press coverage, and he can track the ball and go up and get it at the high point easily. He can already play two receiver positions, so with Jarius Wright in the slot and Jennings and Hunter able to play both positions, the Vikings passing attack might not be terrible. We will still likely grab another WR later in the draft, since Greg Childs is still injured. The Packers would love to upgrade their interior OL or their DE situation here but the value of grabbing Eifert here was too good to pass up. He and Finley represent an ultra dynamic set of TEs that will cause matchup nightmares for defenses. With Jennings leaving in Free Agency, there will even be some more passes to go around to keep the mercurial Finley happy with his touches. The Texans have one if the best running backs in the game, a few of the best sack artists in the game, and one of the most talented receivers in the game. So why can't they get over the hump and make a deep run in the playoffs? As much as I wanted to pull the trigger on Geno Smith here because I have no confidence in Matt Schaub, I have even less confidence in the guys behind Andre Johnson. Hopkins has great separation skills, sharp route-running, and extreme quickness in and out of his breaks. He can move well with the ball in his hands. He can pretty much do anything that you want a receiver to do, which the Texans haven't been able to say about their #2 in a long time. The Broncos have few needs at this point but RB is by far the most glaring. Lacy is a powerful runner with great instincts. His running style is a perfect fit for Mannings offense and gives the Bronocos much needed stability at the position. The Patriots don't really have a ton of needs on the offensive end, so they'll continue to target the defense. Alonzo Dennard was a 7th round pick that assumed the starting corner role last year, and while that was very pleasant, the Patriots need to add depth at the position. Hayden is a juco kid that played his college ball at a smaller school, but he showed some great instincts and ball skills at the D-1 level. New England will likely be protecting the lead late in games more often then not, so it always makes sense to load up on quality options in the secondary. Atlanta has been very active trying to build the strongest team possible to make a run at the Super Bowl, and with Tony Gonzalez returning for one last year, there are few holes left to fill. Corner and defensive end are really the only two needs I can see, and the war room was torn between Tank Carradine, Datone Jones, and Jamar Taylor. In the end, Taylor's size, speed, character, and work ethic make him a perfect fit for a team looking for the final piece to the puzzle. He is physical, athletic, and instinctive. The 49ners have one of the most talented rosters in the league with few holes. So they add great rotational depth here in a talented DT from the Tar Heels. They do have to provide their qb with more weapons at some point in the draft but the 49ners like to build from the inside out. How do you replace a legend? How do you replace two?!? That's the question the ravens have to face with the loss of Ed Reed and Ray Lewis. Asking a rookie to do that is cruel, but Matt Elam possesses the skill-set and toughness to erase the gaping hole that Reed's departure opened up. His style of play and his attitude already has a Raven feel to him. He covers a huge area of field, can play the run well, and he has a chip on his shoulder every time he lines up. 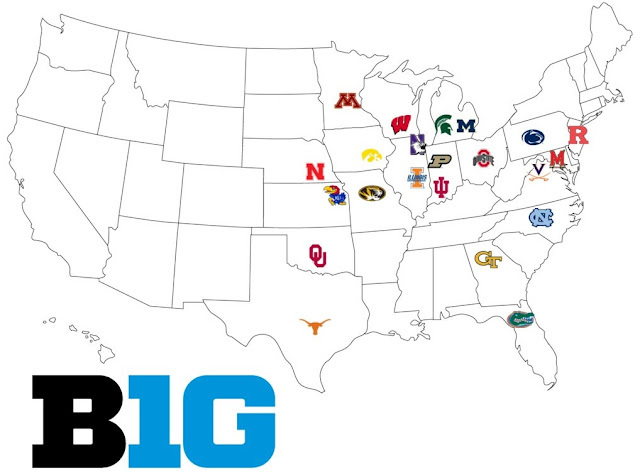 Now for part two of our look at the B1G's expansion I'd like to explore potential schools that Jim Delany would like to incorporate into the conference from the Southeastern US. When you think B1G, think large market, and think AAU in the southeast there are a few Universities that Delany must have his eye on. Here is the list of AAU colleges in the Southeast. Those are very clearly some top academic institutions so we've met that requirement right off the bat. You'll remember from the last article about this I mentioned that the three requirements were. Finally we'll need to see what cities are also part of a contiguous footprint to the current Big Ten or will need to keep that in mind as we expand the conference. So out of that list of TV markets let's see what schools are in or near the Top 30 DMAs that are also in the Southeast. All of them make the list but Tulane in New Orleans, which was actually surprising to me. However, here is the list of what size DMA each school sits in. Some are lucky enough to straddle more than one and thus bump up their ranking. While it's hard to say Johns Hopkins really carries both Baltimore and Washington it is essentially in both DMAs. However, so is the University of Maryland which the Big Ten just acquired so I doubt they'd be looking to sign another school in that market thus duplicating efforts and creating redundancy. That's not the sign of a well run business. Just by looking at that diagram it would make sense to say that Florida, Duke or UNC, Georgia Tech, and maybe Virginia would be the top choices for the Big Ten. I say "maybe" Virginia only because Maryland already fills up a lot of the Washington market if they are successful so they wouldn't be nearly as major of a win as the other schools who are more alone in their markets. There are rumors that UNC has been reluctant to leave the ACC. However I’d suggest that if Delany can get Florida out of the SEC then he would be able to get UNC to leave the ACC, skip the SEC’s inevitable invite, and head right for the B1G too. To me, Florida is the lynch pin. Delany wants to go big and there aren't many bigger than Florida. (Actually there are only three bigger, Texas, Ohio State, and Alabama). So if Delany takes UNC and Florida that leaves two teams in the East. For the sake of contiguity it looks like the additions of Virginia and Georgia Tech would lead the Big Ten right down the East Coast. People might say that Georgia Tech doesn't carry Atlanta but I feel like Delany views the B1G as somewhat of a Kingmaker. Meaning that if he should bless Georgia Tech with an invite to the B1G, then with the uplift in competition, the big name teams rolling through, the increase in cash flows and potentially improved on- field product, then it’s only a matter of time until the ramblin’ wreck is the hottest ticket in town. My guess is that he feels the same way about all of these acquisitions. Rutgers might be a small draw (although it is the largest draw of all college teams) in the NYC market compared to Ohio State in Columbus but if you imagine an uptick of even a few percentage points, that is an enormous market to be captured. I’d bank that Delany thinks just like I do in my belief that joining the B1G makes Rutgers even more competitive and that uptick in market share is extremely likely. Watch out if they outperform expectations on the field and they can tap into both the #1 NYC and the #4 Philadelphia TV markets, that's 10.3 million homes! By the process I've outlined above it stands to me that if the Big Ten should decide to expand it would look to UVA, UNC, Georgia Tech, and the University of Florida to become members. Not a bad haul for just the first leg of the journey! Just check out that Eastern Conference map at the top of the post! Now that we have identified four potential Universities that move the B1G’s reach further into the Southeast per Mr. Gee’s comments, we have to look to the Midwest for the others. That's for next time though, so check out our next post in the series with a few more surprises.